One of our most important programs at OMID is sport in general, and mountain climbing in particular! Mountain climbing gives our young women a well-deserved sense of achievement as well as doing wonders for their self-confidence. 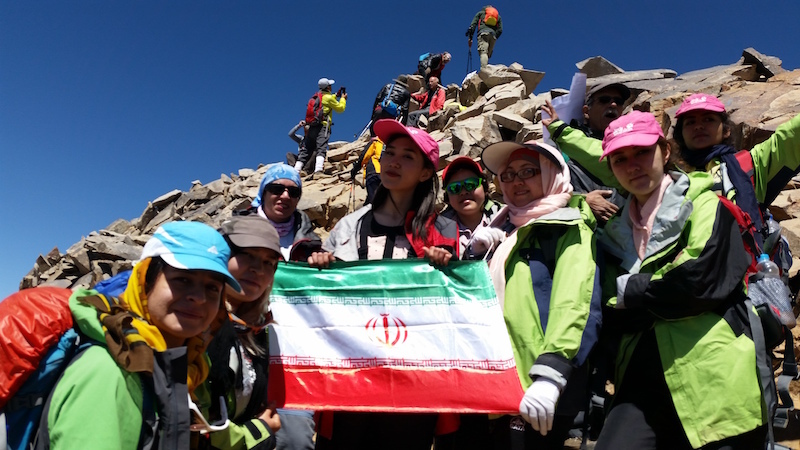 Our young women climbed to Mount Damavand the highest mountain in Iran two years ago and this year they set their sights on Alam Kooh, the second highest mountain in Iran at 4,850 meters. 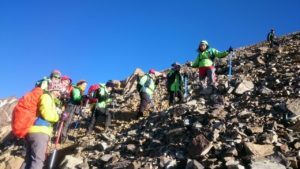 The training for this climb started well in advance, under the supervision of Ms Zandi their climbing coach, and the young women spent a few nights in July on Mount Tochal to get used to the low levels of oxygen and high altitude for their up and coming four day trip. The girls started out on Tuesday, August 3, at 12 midnight from our center in Tehran. 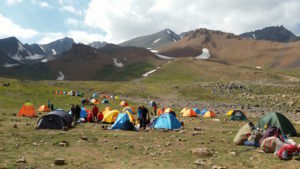 They reached the mountain climbing federation station in Roodbarak at 5.30 am, had their breakfast, changed into their climbing outfits and after an hour and half on a pick-up truck through roads washed away by spring floods, they reached Galoogah Pass. 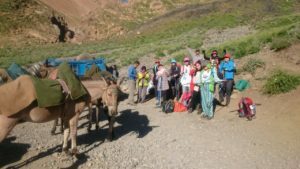 There they put their heavy loads on mules and started to walk through snow left from previous winter and headed up the glaciers to the Hesar Chal base camp with it’s breathtaking scenery. Here the girls had lunch and set up their tents and rested for two hours before starting a two hour climb and descent, to get used to the elevation. 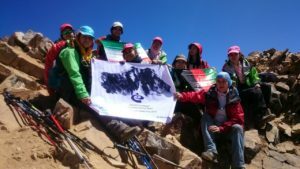 These young women from OMID had been the first group to reach the base camp in an area which is so popular with climbers. By the time they returned to get some sleep, there was barely enough space left to pitch another tent. The next day at 4.30am the climb for the summit started with slow, cautious and steady steps, as just the previous week two climbers had fallen to their death on the same pass. The young women reached the summit at 12.30pm and after resting and taking pictures started to head back down. They all reached the Climbing Federation camp site by nightfall, where they rested, took a shower, had dinner and went to bed. The next morning the bus trip to Tehran started at 6.30am and reached the OMID center by 3pm. “My life has been truly transformed by my time at OMID. This climb being one of the main life changing moments I have experienced.” Said Nadia, who was fifteen, homeless and working on the streets just before she enrolled in our program! 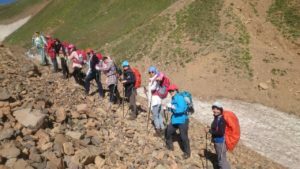 Two years ago 10 young women from OMID chose to be a part of a mountaineering club climbed their way to 5,610 meters, the peak of Mount Damavand. 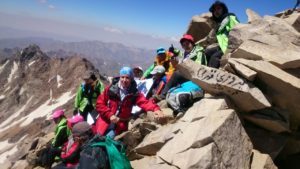 The climb took about two days to complete and took place on a suspected active volcano which is also the highest peak in Iran and the Middle East. Watch the above video about their big climb to find out how this experience empowered them. Heres a clip from this big climb.